Initial payment of +VAT followed by monthly payments of £229 +VAT . Based on REMOVE* miles per annum. Business users only. *Excess mileage charges apply. Finance subject to status. A guarantee may be required. Terms and conditions apply. Unless otherwise stated, metallic paint at extra cost. Library image for illustration purposes only. 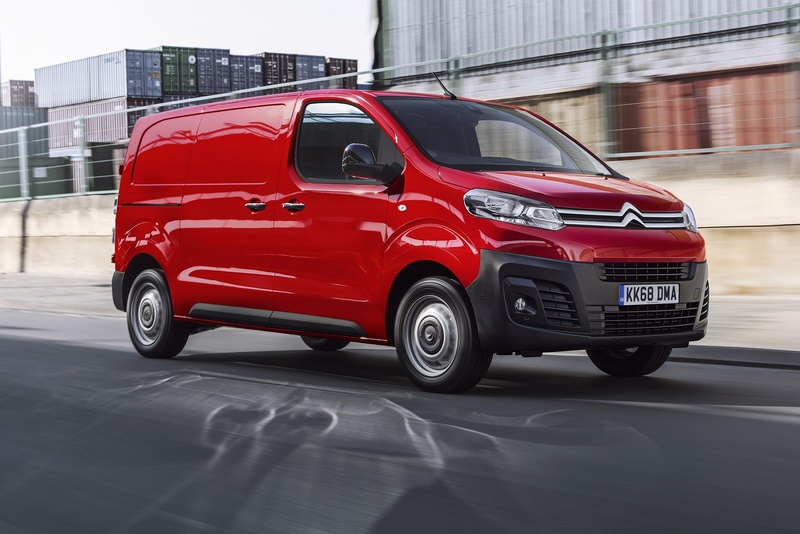 The Dispatch is Citroen's idea of what a medium-sized van should be and goes up against some tough LCV rivals in this sector like Ford's Transit Custom and Volkswagen's Transporter. Style, size and technology are all factors that now rank in this much improved third generation model's favour though, in a package that has much to offer in its tightly-fought segment. With this latest generation Dispatch, Citroen aims to almost double its market share in the LCV sector, so this van had better be very good indeed in this MK3 model guise. This is Citroen's new-generation Euro6-compatible entry in the volume medium-range van sector, where VW Transporters, Vauxhall Vivaros, Mercedes Vitos, Renault Trafics and Ford Transit Custom models rule the roost. Taking on this lot isn't something you'd want to do single-handed, so the French brand has chosen to share this design not only with its partner Peugeot's Expert model, but also with Toyota's Proace and Fiat's Talento: all these vans share the same platform. The previous generation version of this vehicle didn't significantly trouble the main players in this segment. This MK3 model though, has got itself sorted out, with more sophisticated design and larger load volumes that rival anything in the class. You get clever design, proven engines and low running costs in a package that certainly works on paper. Whether it'll cut the mustard day-in-day-out though is what we're here to find out. Citroen reckons that the handling on this MK3 model Dispatch is much improved, narrowing the dynamic gap in this regard to the class-leading Transit Custom. Engine choice in a Dispatch is pretty straightforward, provided you've a clear idea of the kind of work you want it to do. Sensibly, all the Euro6 units on offer are diesels and if your needs are mainly based around lighter loads and short distance urban work, then the entry-level 95bhp 1.5-litre BlueHDi unit may well be quite sufficient: this engine's also offered with 120bhp. For heavier payloads and longer journeys however, you'll be needing the 2.0-litre BlueHDi model which gives you a lot more pulling power and is available with either 120, 150 or 180bhp, the most powerful unit mated to the brand's efficient EAT6 auto transmission. A key factor behind the success of the previous generation Dispatch was the way it remained compact and wieldy in the manner of smaller, more car-like vans from the class below. This model's bigger of course, but it retains much of that same usability around town and rides much better thanks to revised suspension and a stiffer EMP2 platform. Special wishbone filtering dampens the impacts of our country's terrible tarmac and the variable stiffness springs and shock absorbers deliver surprising levels of comfort whether the vehicle is loaded or unloaded. Citroen also claims that refinement is much improved this time round. And, as before, there's the option of a Grip Control traction system. We also like the 'Driving time warning system' which flashes up a dash warning after two hours of uninterrupted driving at speeds of 40mph and above. This Dispatch may share much under the skin with its Peugeot Expert PSA Group stablemate but visually at least, it has its own distinct personality, Citroen's designers having gone for a fluid, softer face with a short bonnet and high headlamps. Visually, it's quite hard to pigeon-hole this vehicle into a particular market category. You can see that it's bigger than something like a Berlingo or Kangoo-sized Peugeot Partner but you might question whether it has the volume to take on medium range vans of Transit or Vito size. As we'll see, it has. On board, Citroen's designers have concentrated on improving ergonomics and driving comfort this time round. You get the usual high seating position and three-person bench. And there's certainly more cab storage space - 49-litres of it in the standard van version. Providing you haven't bought in with entry-level trim, the first thing you'll probably notice about the restyled interior is 7-inch colour touchscreen that's now been added. It can work with voice control and offers the usual 'phone and media features, plus an optional 3D Navigation system. Pricing for his Citroen is, as you might expect, pretty much identical to that of its Peugeot stablemate. That means VAT-exclusive asking figures that'll probably see you paying somewhere in the £17,500 to £26,500 bracket for your Dispatch, depending upon the bodystyle you choose. As well as the usual panel van, there are Platform Cab and Crew Van options. Van customers get a choice of 'Compact, 'Standard' or 'Long' body lengths. Buyers choose between 95, 115, 120, 150 and 180bhp versions of the brand's familiar BlueHDi diesel engine Equipment levels are a lot more complete than they used to be for Dispatch owners. All models now get twin front airbags, a DAB radio, Bluetooth 'phone compatibility, cruise control with a speed limiter and twin sliding side doors. As usual, there's a full steel bulkhead and a three-person front bench. At the top of the range, plusher models further include 16-inch alloy wheels, a rear parking camera, metallic paint, auto headlamps and wipers, body-coloured bumpers and an upgraded payload. New safety features include Road sign reading that flashes road signs up on the dash as you pass them. Plus, depending on trim level, your Dispatch can now come with things like 'Driver Attention Alert' to combat drowsiness, a Lane Departure Warning System, Blind Spot Monitoring, Automatic main beam switching, a head-up display and Active Cruise Control. You might also want to specify the 'Park Assist 180' camera system. If you�re looking for a new Citroen Dispatch M Diesel 1400 2.0 BlueHDi 150 Van Enterprise Plus for sale, you�ve come to the right place. At Bristol Street Motors we don�t just have the best Citroen Dispatch M Diesel 1400 2.0 BlueHDi 150 Van Enterprise Plus deals, we also offer friendly advice and help with all your enquiries to ensure your buying experience is a happy experience.